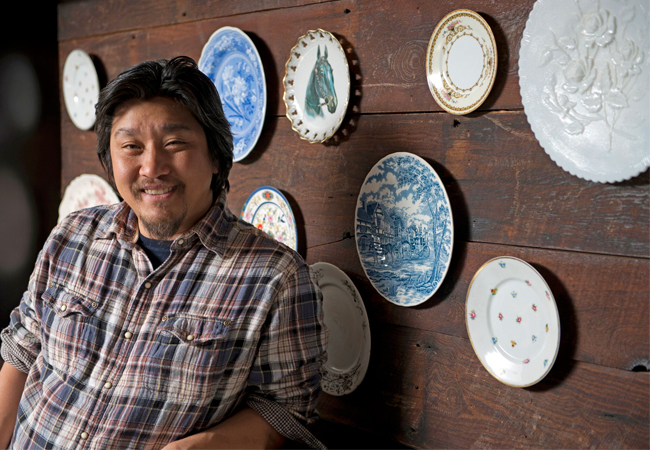 Whiskey Dry is Chef/Restaurateur Edward Lee’s newest venture. Here, his off-the-cuff comments on his latest entry into our dining scene. You never stop coming up with new food and spirits experiences. Why Whiskey Dry? Whiskey is having a true renaissance in America right now. Though I love the fact that bourbon is getting all the attention, we also want to tell the story of global whiskey, like the exciting new Scotch producers, American single malts and Japanese whiskeys. Plus, I get to make all these crazy delicious burgers that go well with whiskey. What’s your take on cheeseburgers and milkshakes? We want them to be creative and fun and BIG. We want to be as creative with our burgers as we are with our other approach to cuisine at my other restaurants. This is by no means a fancy restaurant but that doesn’t mean we can’t have fun with our burgers like a Foxhollow Farms BBQ burger, a lamb burger and our take on a fast food burger we call The Big Ed. Also, I’m really excited about our boozy bourbon milkshakes. What shouldn’t people walk out the door without having ordered? Definitely try the Hot & Sour Whiskey Onion Soup, The Big Ed and the Jameson’s Irish Whiskey Milkshake with Pistachio Ice Cream, Dried Cherries and Coffee Syrup.